Annelies Hoek is today one of the most appreciated and famous portrait painters in the Netherlands. At the ‘Rijksacademie’ in Amsterdam her skills for portrait painting became clear. Her teacher at the art school was Prof. Sierk Schröder, the most important portrait painter of the time. In the beginning of their marriage (Hans van de Loo) and the birth of their children, Katelijne and Floris, they have lived in Kenya for several years now. 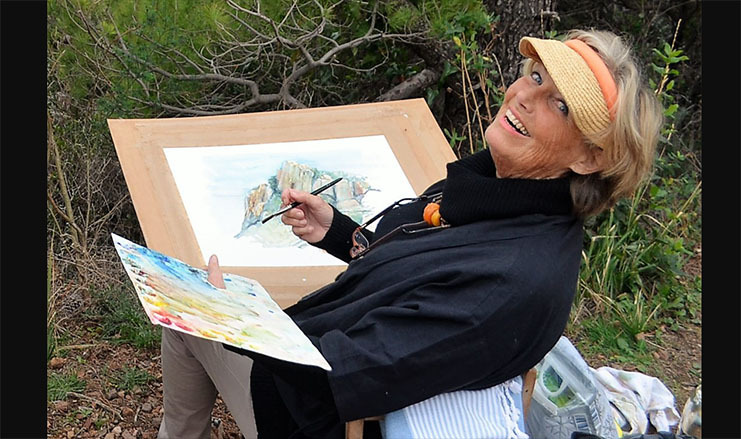 There and on many other trips, such as: Tanzania, Ethiopia, Guatemala Nepal and Myanmar, she made striking sketches of the people around her, in pencil, oil and watercolor. Some were later used as promotional material for charities. “To catch people’s emotions, to take time to observe someone, to search for their unique qualities and to tell the world in tassels about them” is the most exciting challenge for her. In 1995 she was commissioned to produce an official state portrait of H.M. Queen Beatrix. It was reproduced in an edition of 200 screen prints, spread all over the country in, among others, Municipal Houses and other public buildings. In 1998 she settled with her family in a restored farmhouse with studio between fruit trees, meadows and ponds. She not only paints portraits, but also nudes, figures and still life. 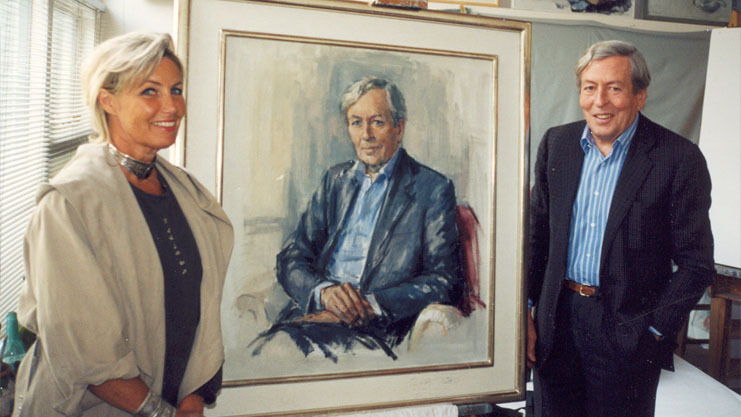 In 1995, she was commissioned by the RVD to produce a state portrait of H.M. Queen Beatrix. For this assignment, Her Majesty posed several times in person. A screen print was made in a 200 edition. These have now been sold out. Annelies Hoek made various designs and paintings of H.M. Queen Beatrix, which were later reproduced and still available on this website. Not only the numerous portraits in private collections but also the many official portraits for public agencies and companies can be found in private places and abroad. In her free work, especially her nudes, figures and still lifes, she experiments with colors, techniques and materials. “My main source of inspiration is the human being. As a child, I drew gnomes, fairies, later my classmates or teachers, afterwards family and friends. At the academy a lot of drawing and painting was also drawn to the model, and so my specialization in the portrait was absolutely natural. “Don’t you get enough of all those eyes, noses and mouths?”, Someone asked me last. Well, ask a laboratory researcher if he does not have enough of to look at that microscope! No, it is always a challenge to express the different backgrounds, characteristics and feelings of each individual with the proportions, colors, light drops of the model’s (com)position. My method of doing this is: as much as possible painting to living model, so that I can talk to the “model” and get to know the person better and 2. (because it can not be in a few minutes), it eventually falls out of his role “And forget that I look at him is no longer aware of himself and more of his inside. My technique falls under the term ‘a la prima’, ie. Painting (in oil) without pre-fabricated coatings or sketches. It is therefore important to register immediately and thereby maintain spontaneity and speed, including in the paint region.